Creed II, the follow-up to 2015’s surprisingly successful Creed, runs afoul of a common problem to plague unplanned sequels: the need to match audience expectations trumps all other concerns, including creative latitude. The eighth installment in the long-running Rocky series is by no means the worst of the bunch but it’s among the most disappointing. Like the first sequel, it suffers from the necessity of having to move forward a story that was perfectly closed at the end of its predecessor. While Creed used boxing as a springboard for a deep and compelling examination of life and human nature, Creed II ends up mired in clichés with a narrative constrained by a bland and generic structure. Everything you think is going to happen in Creed II probably happens because the movie isn’t trying to be original. By playing things too safe, it loses the power and spontaneity that gave Creed its energy and drive. Perhaps the biggest subtraction from the production team for Creed II is Ryan Coogler. Coogler, who directed and co-wrote (with Aaron Covington) Creed, has only an Executive Producer credit for Creed II (production of this film conflicted with that of Black Panther). Sylvester Stallone, who wrote all six of the primary Rocky films, is back in the screenwriter’s chair (along with Juel Taylor) and his script contains many of the same flaws as Rocky II. Director Steven Caple Jr. has a thin resume, with only one low-budget feature (The Land) to go along with a number of shorts and TV credits. Creed II has a traditional three-act structure. The film starts with a perfunctory chronology of how Adonis Creed (Michael B. Jordan), recovered from his close loss at the end of the earlier installment, fights his way back to the top, eventually claiming the title. Once the belt is his, however, he loses his focus so, when goaded into a grudge match with up-and-coming Russian slugger Viktor Drago (Florian Munteanu), the son of Ivan Drago (Dolph Lundgren) – the man who killed Adonis’ father in the ring – he is unprepared. When this fight fails to resolve the bad blood between the men, a rematch is required. Meanwhile, Adonis has personal issues to resolve. His girlfriend, Bianca (Tessa Thompson), is pregnant with his child and his mentor, Rocky (Stallone), now recovered from cancer, is on a different page from Adonis about the Creed/Drago bout. The most interesting character in Creed II isn’t Rocky. Neither is it Creed or Bianca. They feature some forward movement but their development is minimal compared to what it was in Creed. Instead, it’s Ivan Drago, who explains to Rocky how his entire life collapsed following his defeat at the end of Rocky IV. He became despised and scorned. His wife, Ludmilla (Brigitte Nielsen, in what amounts to a cameo), left him and his country turned its back on him. He trained Viktor to fight in an atmosphere of anger and rejection. In no small way, Creed II is about this father/son pair…except their relationship isn’t given sufficient screen time for it to have any emotional impact. One could argue that Creed II would have worked better had it been called Drago and re-developed accordingly. Critical acclaim and Oscar recognition (in the form of a Best Supporting Actor nomination for Stallone) rightly surrounded the 2015 film’s release. 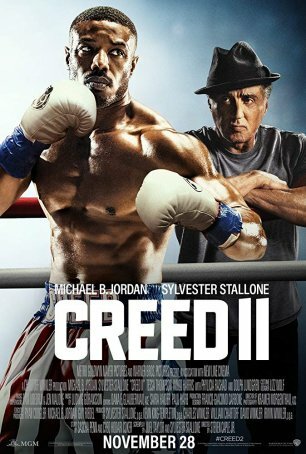 That’s unlikely to happen with Creed II, although many will notice the similarities between the sluggish, unfocused Rocky II and similar qualities evident in this latest installment of the same franchise. To an extent, the film’s rousing ending (a description one can apply to most competently-made boxing movies) diminishes the inconsistent beginning and flabby middle. Don’t expect any surprises, however. Creed II was assembled using a template defined by what the producers think audiences expect. It remains to see whether this will prove to be a winning formula at the box office.